Update 10:29pm EDT: Game postponed to 8:37pm Saturday. Will resume in second inning. 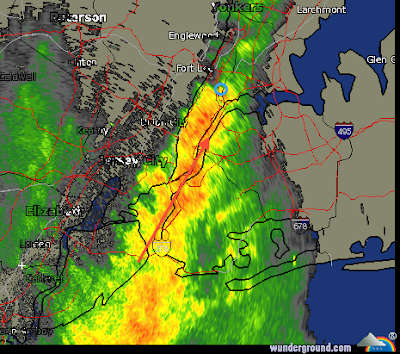 Here is the radar as of 10:07pm EDT. Yankee Stadium is the blue circle and the red arrow is the direction of movement of the storms. This is the European 10-day rainfall forecast from AccuWeather's Professional web site. 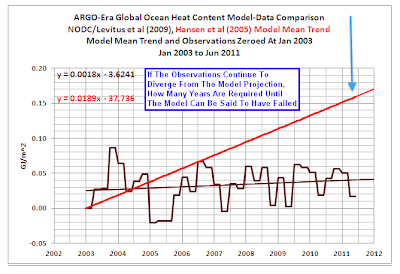 I have run through all of the applicable models' (U.S., Canadian, Japan, etc.) 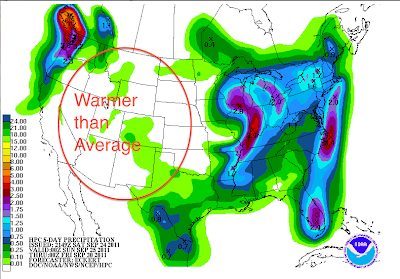 extended U.S. forecasts and all indicate significant rainfall from Kansas, south, starting about this time next week and lasting through the weekend. Let's hope they are correct. Thanks NPR and Barnes & Noble! Continue to receive great feedback from the NPR interview. If you missed that episode of Big Picture Science just click here. 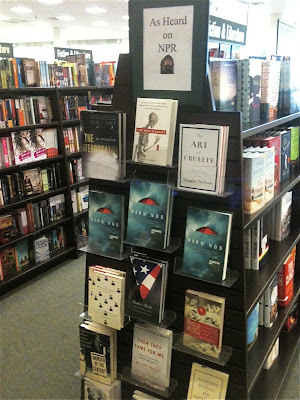 We also appreciate the support of NPR-featured books in Barnes & Noble stores. If you haven't read Warnings, please consider stopping by your neighborhood Barnes & Noble and checking it out. SEATTLE, WA –U.S. 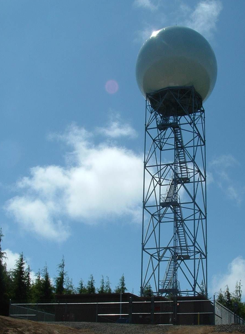 Senator Maria Cantwell (D-WA) announced that Washington state’s first coastal Doppler radar, located in Grays Harbor county, has been plugged in for the first time and is now sending test weather data to the National Weather Service’s Weather Forecast Offices located in Seattle and Portland. The state-of-the-art Doppler radar is undergoing testing this month and then will be one of the first in the nation to be upgraded with the latest enhancement to radar technology in civilian weather forecasting, called dual polarization. 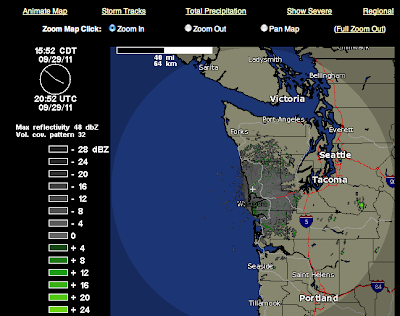 Western Washington’s only other Doppler radar is located on Camano Island, but the radar’s reach is largely blocked by the Olympic Mountains, causing large gaps in weather data of storms approaching the Washington coast. The new coastal radar will help close this data gap, enabling forecasters to better determine wind speed and rainfall of incoming storms to give more accurate and timely warnings to residents in harm’s way and help prevent loss of life and billions of dollars in property damage. Published by The Kansas City Star, "Joplin 5:41" is the story of the Joplin tornado in a "coffee table"-style book. It merges a number of stories into book form with lots of color photos. The single most innovative item in the book is a 360° "fold out" of tornado damage and time-line/geography diagram. It is a great idea but the execution is mediocre. The writing is a little uneven in places. 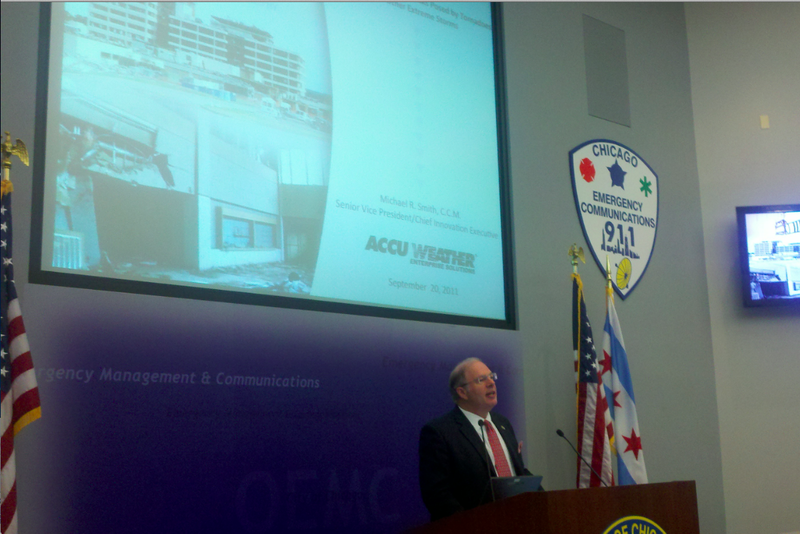 It is strongest when talking about the hospital and start of the 2011 school year. Its writing about the storm itself and its genesis is weak. That said, I like the book and would recommend it to those that are interested in learning more about this horrible storm. It is very reasonably priced at $29.95 considering the number of high-resolution color photos. I would give it 3 out of 4 stars. 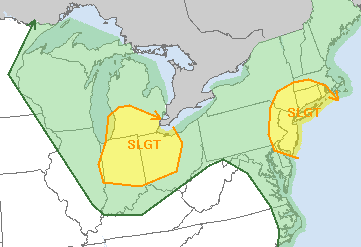 A slight risk of thunderstorms with hail ≥1" or winds of 60 mph or more in the yellow areas. There is also a slight chance of tornado in the NJ-Mass forecast area. AccuWeather regional radar at 1:47pm EDT shows scattered thunderstorms across the region. These are expected to intensify during the afternoon. At 2pm EDT, flight delays of 30 min. or more are reported at Newark, JFK, LaGuardia, and Philadelphia. I seem to spend a lot of time at Chicago's O'Hare International Airport. As I passed through last week, I was very pleased to see that storm shelters were in the process of being marked. Looks like some airports are learning the lessons of the incidents at the St. Louis and Omaha airports earlier this year. Congratulations, O'Hare! 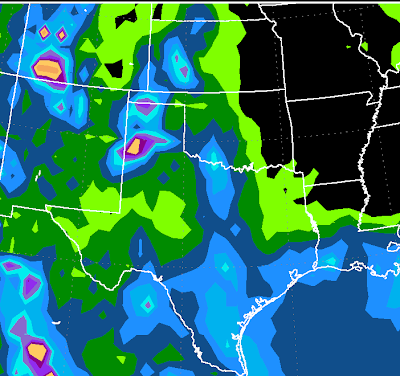 This is fairly encouraging given that the models typically under forecast rainfall this far out. 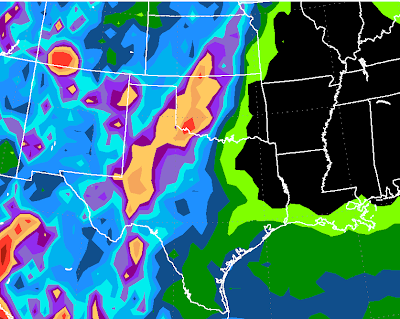 While these amounts are not large, it would be good just to get the dry pattern to break. Keep your fingers crossed! ...For the National Weather Festival in Norman, OK on Saturday, October 29. Mindy and I will be there autographing and selling copies of Warnings along with storm chasers, hourly weather balloon launches, and tours of the largest combined college and government weather facility in the U.S.
We'll have much more in the next couple of weeks, so keep checking the blog! 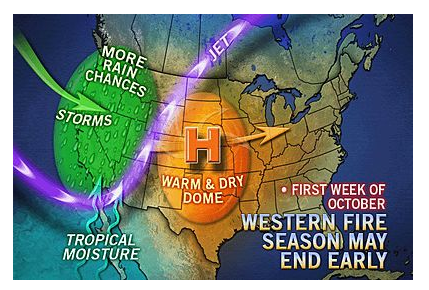 A high pressure center covering the central and western United States. The low, centered near Reno, is what will cause the early start of the rainy season in California and will bring rain to much of the West. 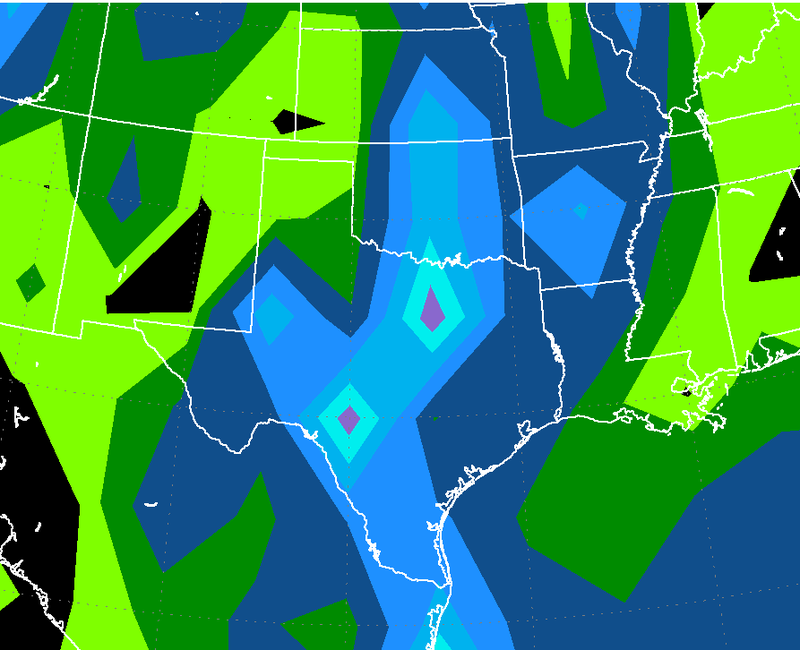 There is a chance -- just a chance -- that some desperately needed rain may occur from Texas to Kansas. However, the U.S. extended-range model (from 10 to 15 days) shows the western system rapidly weakening and moving farther north. Given 2012 winter wheat planting that is occurring now, these model forecasts have the potential to move markets, so I decided to comment on them even though, at this point, it is only educated speculation as to whether significant rain may fall in the winter wheat belt. 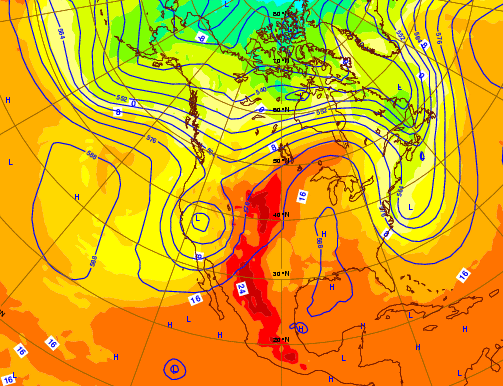 Of course, the problem is the extremely persistent high pressure system over the central United States that is causing Texas' record drought and fire season. There is no sign of significant change in that high for the next ten days. The Alabama Emergency Management Agency expressed doubts about the deadly impact of that day's power outages because the potential for particularly nasty weather had been widely publicized throughout the week. "It wasn't like it shocked all of us," said Yasamie August, a spokeswoman for the agency. There is a very big difference between, "severe thunderstorms will likely occur on Wednesday" (spoken by a weathercaster on, say, Tuesday evening) and, "A tornado is headed for your neighborhood! Take cover now! ", particularly when you have been distracted by dealing with an all-day power outage. But Schmidt said he understands and endorses the use of tornado sirens when strong winds threaten areas where camping and boating are popular. Butler County sounds the sirens in El Dorado and next to El Dorado Lake any time confirmed winds of at least 80 mph are moving into the area. "We can have 40,000 people at the lake," Schmidt said. "If there are 80-mile-an-hour winds coming and you're in a camper, it is a whole lot different than if you're in a nice brick house." Jim makes a good point and I agree provided the sirens are only sounded near the lake and that signs are erected at the Lake's entrances to explain the policy. Elsewhere, I believe it is bad idea to sound sirens for severe thunderstorm warnings. Don't Believe Your Eyes, Believe the Tornado Warning! As Mr. Johnson confirms, Doppler radar is a powerful tool and is far superior to the untrained eye. Please take shelter whenever the sirens sound! I won your book "Warnings" in a Twitter contest earlier this summer. To say that I was less than thrilled when I saw it would be an understatement. Uh, oh, I thought. An unhappy reader. I jumped to an incorrect conclusion. However, I decided it would be an appropriate read for the weekend of Hurricane Irene's predicted destruction. I was pleasantly surprised to find myself absolutely riveted from the first page. I still cannot get over the fact that weather forecasting has improved so dramatically in just the last few decades. My generation takes this technology for granted and it was quite humbling to read the stories of how those before us suffered in order for progress to be made. I have a new appreciation for meteorologists and no longer view them as undeservedly overpaid workers when their forecasts are inaccurate. No, Maria, thank you! Reading your letter made my week. 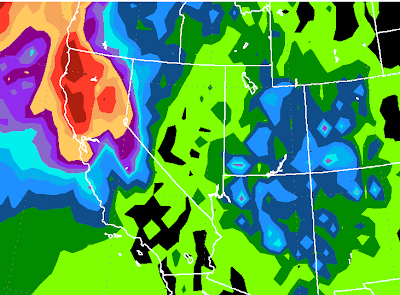 Unusually Early Start to Rainy Season in California? The dark maroon areas in northwest California indicate more than 4 inches of rain over the next ten days. If correct, this would be an unusually early start to the rainy season. From Esquire: Here is the behind the scenes story of what happened to bring those people together in that location at that time. With "Pan Am" making its debut last night, we got a look at the era when flying was fun. I'm not a person who pines for the past, but I'd love for that era to return. You can watch their dialog here. 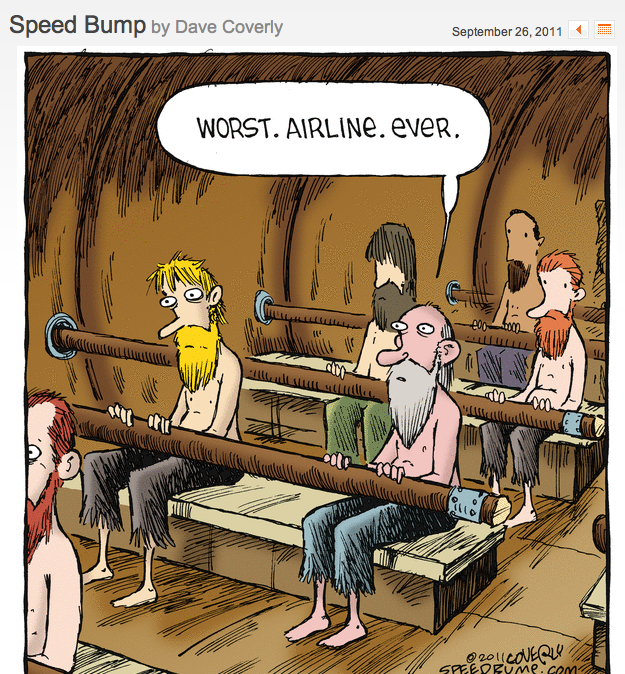 Today's Speed Bump comic is about the state of the airlines. 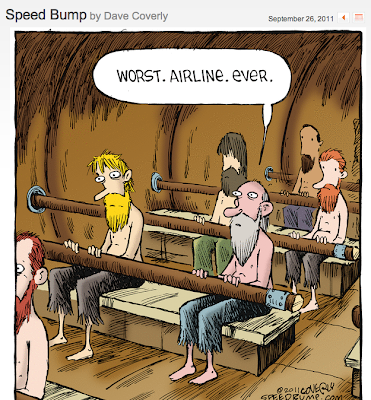 I suspect that cartoonist Dave Coverly does not fly very often as the airline depicted looks pretty good, especially compared to the regional jets. There is no one in the center seat, there is plenty of legroom, and the stone seats are at least as comfortable as RJ seats. Is the Weather Getting Worse? No! Index based on number and strength of hurricanes worldwide. The entire study is here. 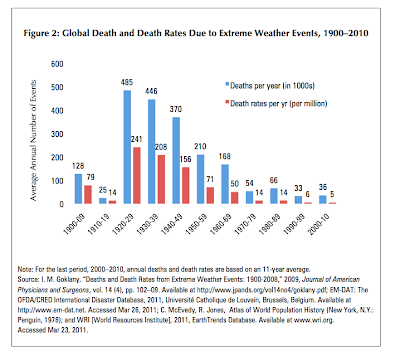 Here is the trend in worldwide weather mortality. ADDITION: 9:15pm. 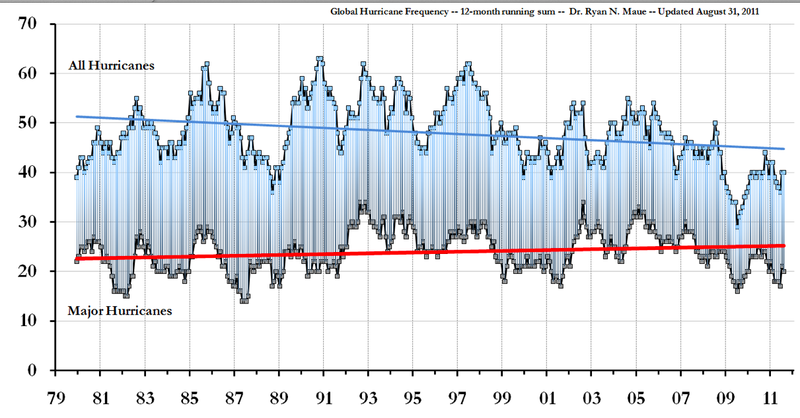 More evidence there is no increase in hurricanes landfalls from an actual meteorologist and climate scientist. Near Milwaukee over Lake Michigan. From WTMJ TV. Click link to view. I was reading the Wichita Eagle over breakfast Thursday and saw a fascinating story that Einstein's "Theory of Relativity" might be proven false. "The feeling that most people have is this can't be right, this can't be real," said James Gillies, a spokesman for the European Organization for Nuclear Research, or CERN, which provided the particle accelerator that sent neutrinos on their breakneck 454-mile trip underground from Geneva to Italy. Going faster than light is something that is just not supposed to happen according to Einstein's 1905 special theory of relativity — the one made famous by the equation E = mc2. But no one is rushing out to rewrite the science books just yet. It is "a revolutionary discovery if confirmed," said Indiana University theoretical physicist Alan Kostelecky, who has worked on this concept for a quarter of a century. Stephen Parke, who is head theoretician at the Fermilab near Chicago and was not part of the research, said: "It's a shock. It's going to cause us problems, no doubt about that — if it's true." It was so refreshing to read about someone challenging conventional science without terms like "denier" or "skeptic" or other pejoratives. Nice job, Eagle. We don't often repeat postings at Meteorological Musings but I've been told by people they missed this recent review of Warnings. It was posted at the blog of Prof. Kevin L. Nenstiel, English Department, of the University of Nebraska. It might have been there were seven posts that day. So, for the full review, click here. Thank you, Professor Nenstiel! If you read and enjoy this blog, it is likely you would really enjoy reading Warnings. I would like to say a big "thank you" to all of the new Warnings readers from -- literally -- to coast! I just got the latest Bookscan sales report and we have new readers from Portland, ME to Portland, OR to Orlando to San Francisco! Mindy and I also want to say thank you to the organizers of the Kansas Book Festival today. We had a great time! Made it! We are in the northwest area of the Commercial tent. The weather pattern of the past few weeks will change little next week. 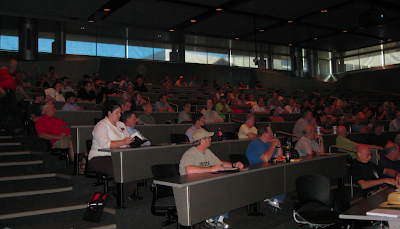 A large crowd turned out Thursday night for the first annual aviation weather seminar at the National Center for Aviation Training. 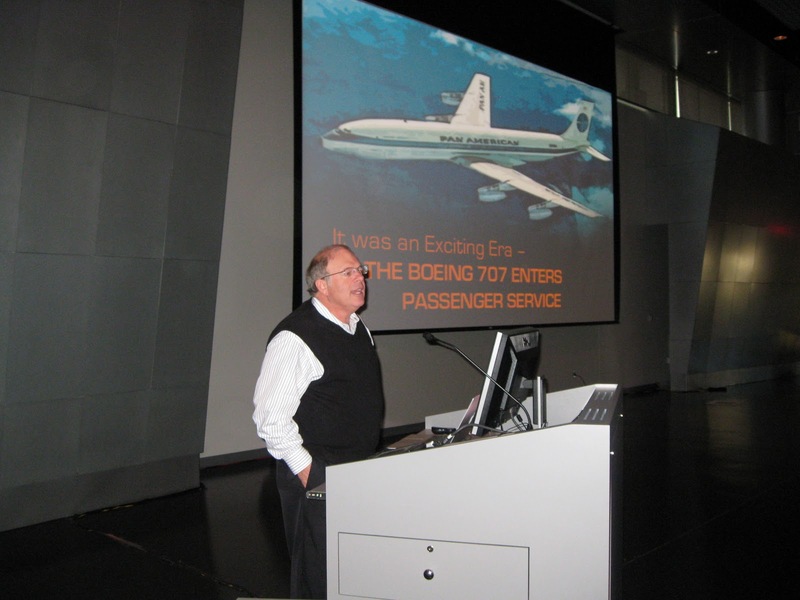 I told the story of how the late Dr. Ted Fujita fought to convince meteorology and aviation of the correctness of his theory that "downbursts" existed and were the cause of a number of airline crashes. As I explain in Warnings, Ted's persistence in the face of tremendous skepticism and envy has saved thousands of lives. The goal of the evening was to better train pilots about weather. 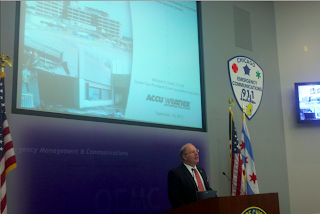 The National Weather Service provided speakers on microbursts, icing, and other hazards. 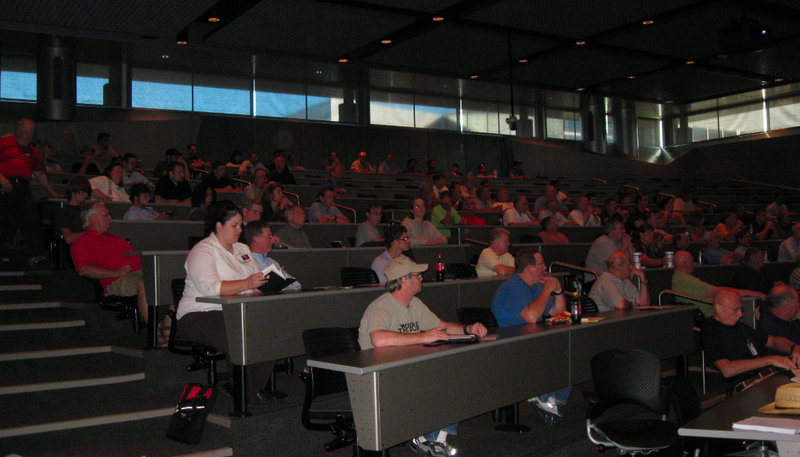 The audience of more than 100 pilots seemed very appreciative of the useful information conveyed. Should have been called "24-Hours of Global Warming Apathy." Seventeen thousand viewers, worldwide?! Really? After all that promotion? I think we are seeing the end of the hyper-politicized catastrophic global warming movement, which is a very good thing. That will better allow us to focus on what may really be a problem with regard to global warming and other environmental issues. Photo from "The Weekly Standard"
I'm a big fan of solar energy and believe it has huge potential as a supplemental energy source. Why supplemental? For the obvious reason that the sun does not always shine as the U.S. Department of Energy found out today when their "solar decathlon" got off to a rainy start. 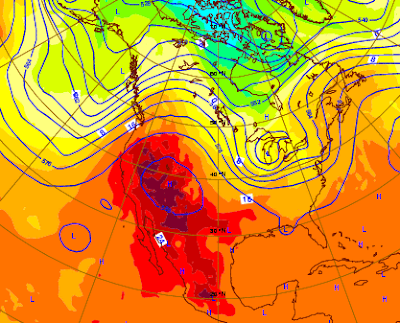 Unfortunately, the outlook for the next week in the East is for cloudier and rainier weather than average. 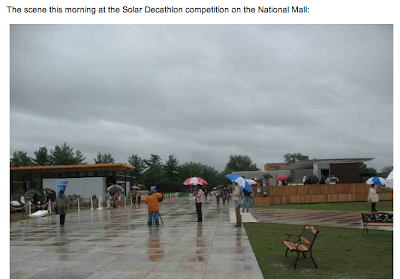 Full story about the solar decathlon is here. Really looking forward to the Kansas Book Festival in Topeka tomorrow. Mindy and I will be there. The weather for the event should be wonderful with a high of 70°, clear skies and gentle breezes. Please bring your copy of Warnings for an autograph or we'll sell you one for $20, tax included. The National Oceanic and Atmospheric Administration (NOAA) now has a tiny aircraft to help study hurricanes. The aircraft is 3' long and weighs eight pounds. 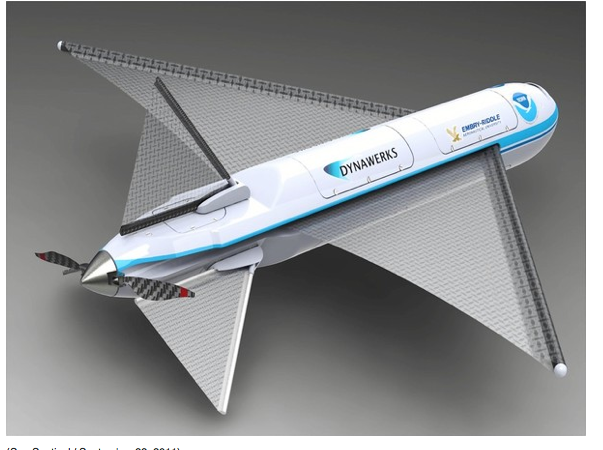 It will be dropped into the eye of hurricanes so it can fly to 100' of the ocean (far too low for humans to safely fly). The goal is to gather data that may help us improve hurricane intensity forecasting. Rangeline Road is the main commercial street in Joplin. 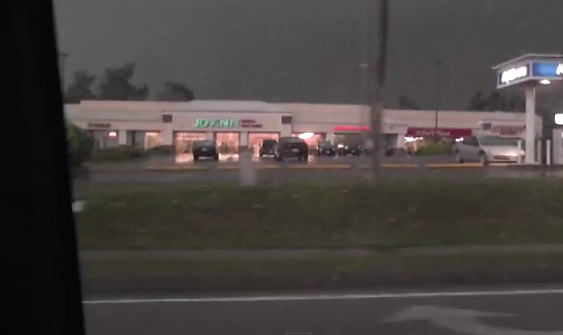 The video below is from a team of storm chasers going south on Rangeline Road, moments before the F-5 tornado wiped out more than one mile (north-south) of the businesses on the road. appears to be just a dark gray cloud mass. 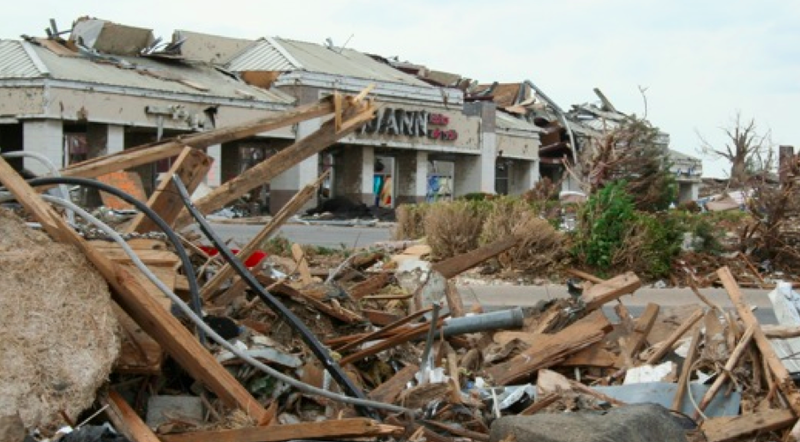 Photo of the above shopping center after the tornado. The video is below. "Can we not break the law?" they ask as they are hung up at a stoplight (that was torn down by the tornado). "Would the Home Depot be a good [shelter]?" The Home Depot was destroyed with multiple fatalities. The video is below and I recommend you select HD. Video demonstrates -- again -- the tornado was not recognizable visually as it moved across the city. Put another way, just about everything you see in the video from :35 to 2:33 was destroyed. When they are stopped at the light (roughly 1:00 to 2:00), they are pointing the camera right at the tornado but it is just a dark gray cloud mass. "Can We Really Call Climate Science a 'Science'?" Increasingly, the answer seems to be "no." In order to be "science," there must be a falsifiable hypothesis. 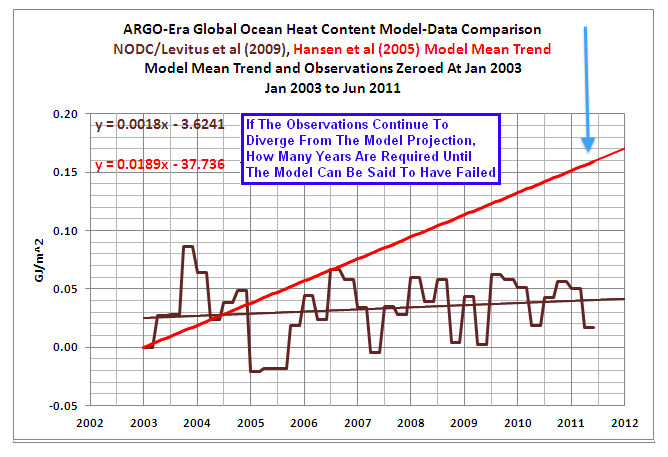 Atmospheric temperatures are colder than the IPCC's 95% confidence interval and ocean heat content is far, far less than it was predicted (red line) to be at this point (arrow). 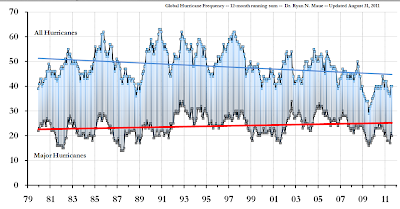 Add in that 'global warming' is to blame for warmer, colder, drought, flood, more hurricanes, and less hurricanes the Al Gore/IPCC supporters' positions increasingly seems to be that everything is "consistent with" global warming. In other words no falsifiable hypothesis. This departure from accepted scientific norms is becoming apparent to others outside of the atmospheric sciences. As someone with forty years experience with peer reviewed journals. I can testify that the Remote Sensing editor’s resignation and public discreditation of Spencer’s skeptical paper would be considered bizarre and unprofessional behavior in any other scholarly discipline. In my field of economics, such unprofessional behavior would destroy the editor’s professional reputation and make him or her a laughing stock. Not in climate science apparently. The above excerpt about the increasingly bizarre professional behavior of climate scientists is from a superb article in Forbes that I urge you to read. Climate science cannot expect widespread respect it believes it deserves until it starts accepting the same standards that apply to all other fields of science. Mike was in the windy city yesterday where he presented his talk "Mitigating the Business Risks Posed by Tornadoes and Other Extreme Weather" to the Chicago chapter of BPRA. He flew home to speak at the Newton Rotary Club in Newton, Kansas last night with his presentation CSI: Meteorology The Phantom Crashes. The complete story can be found in his book WARNINGS: True Story of How Science Tamed the Weather in chapter 13. Mike will be speaking at the National Aviation Training Center in Wichita on September 22, 2011 and will be at the Kansas Book Festival in Topeka on Saturday, September 24, 2011. A substantial number of fatalities occurred in businesses. According to information obtained from the Joplin emergency manager, 24 fatalities occurred in traditional businesses (e.g., Home Depot, Pizza Hut, Wal-Mart), and 21 and 15 fatalities occurred at Greenbriar Nursing Home and St. John’s Hospital respectively. This is highly unusual; between 1985 and 2010, only 4 percent of tornado fatalities occurred in businesses. Over the decade 2001 to 2010, there were 17 deaths at businesses in the entire U. S. It is unclear if the business death toll represents some type of special vulnerability (did employees fail to take safety precautions?) or a consequence of many businesses like the Home Depot on Range Line Road being totally obliterated, rendering normal safety precautions ineffective. Either way, the fatalities in businesses represent an unusual vulnerability. So large, in fact, that a record for the largest hailstone in state history was set: a stone that fell in southwest Wichita had a diameter of 7.75 inches, shattering the existing record by more than 2 inches. 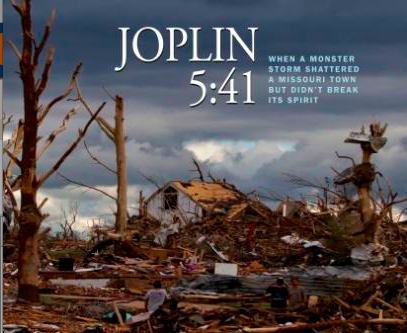 But Scott Blair, a meteorologist with the Topeka branch of the National Weather Service, came across something startling as he researched the Sept. 15, 2010, storm. Checking local media websites, he found photos of one massive hailstone after another. By the time he was done, he had found eight hailstones that were larger than the previous state record hailstone, which fell in Coffeyville in 1970. Thanks to social media, the storm could become a turning point in how data on severe storms is collected and in researchers’ grasp of what hailstorms can do, Blair and other experts say. The Coffeyville stone's record lasted more than three decades. Social media is playing a bigger and bigger role in documenting extreme weather. Details from The Wichita Eagle. To operate larger items which require 120 volt AC power, such as your computer UPS, a drip coffee maker, or a small microwave, use a 1200 watt (1.2kw) inverter – available everywhere for less than $100. Most vehicles today will run a 1200 watt inverter indefinitely while idling, but you may need to turn on the air conditioner (which increases the engine idle) or turn up the idle speed (not legal – do not do this) to make sure the alternator is putting out full power. Also, the family minivan (or coupe, pickup truck, or SUV) is the best survival pod ever invented – heat, air conditioning, lights, etc. You already own it, and the fuel to run it is negligible compared to buying, maintaining, and feeding a generator. If you use a portable generator, please use extension cords to power your loads – do not energize your home wiring unless you have installed an Underwriters Laboratory (UL) listed transfer switch! I will discuss transfer switches later in this article. All rotating loads – well pump, pool pump, air conditioner/heat pump compressor and fan motor, refrigerator and freezer compressors and fan motors – require 60 hz alternating current (AC) to operate at the correct, constant speed, and require full voltage (120 or 240 depending on the motor) to operate at the correct current under load. Let me put that more plainly – a badly regulated generator will burn up expensive motors! 1. Liability – If anyone is ever injured or killed while working to restore power on your distribution grid, you will have proof that there is no way it was a backfeed from your generator. 2. Risk Reduction – If you ever have an electrical fire in your house, you will have proof that the transfer switch was properly installed and inspected. That way you will be able to use any lights, anywhere in your house, including in your basement, regardless of whether you power your house with a 5kw or a 50kw genet. You want to start your genset and make sure it is running right – all engine gauges (oil pressure, battery voltage, coolant or cylinder temperature) and generator gauges (voltage, FREQUENCY, current) registering correctly, and then and only then transfer the load. Even if you never have a power outage, throw your transfer switch once a year to make sure it moves. Also, open it once a year and blow out the insects. Leave a piece of no-pest strip or a livestock ear tag with pyrethrins in there to keep it insect free. Takeaway – Generating your own power during an outage requires serious investment in time and money, and significant fuel and maintenance expenses. At present prices, we spend about $90/day for fuel and oil changes during extended power outages. 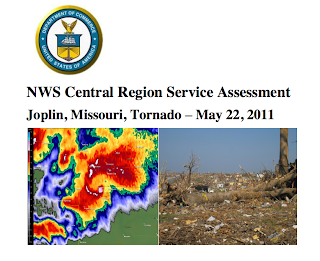 After major weather-related disasters, the National Weather Service conducts a “Service Assessment” to understand what can be learned and what can be improved with regard to their forecasts and warnings. The NWS just released its Joplin Service Assessment pertaining to the storm that killed 162 on May 22.
the perceived frequency of siren activation (false alarms) led an overwhelming number of participants to become desensitized or complacent to this method of warning. Many noted that they hear sirens all the time[sirens] go off for dark clouds, they are bombarded with [sirens] so often that we don‘t pay attention, the sirens have gone off so many times before, sirens are sounded even for thunderstorms, and all sirens mean is there is a little more water in the gutter. Because People Want to “Confirm the Threat for Themselves” – the Invisible Nature of the Rain-Wrapped Tornado Misled People into Believing the Siren Was Sounding for a Severe Thunderstorm Warning. a. Physical observation of the environment (seeing the tornado approach). While significant numbers of people actually did this, the approach was complicated by having a ―rain-wrapped‖ tornado that made the tornado more difficult to recognize until it was very close. There were numerous accounts of people running to shelter in their homes just as the tornado struck, despite significant advance warning of the risk. The report confirms my recommendations that sirens should only be sounded in extraordinary circumstances (tornado) and then only in the areas directly at risk. The multicounty siren activations in areas like St Louis lead to complacency and the opposite public response from what emergency management would like. To individuals, take shelter when the warning is issued. Don’t run outside trying to figure out the threat. Governor Deval Patrick has signed two important bills further positioning Massachusetts as a leader in clean energy and environmental stewardship: the Green Jobs Act, which will support development of the clean energy technology industry that will move Massachusetts toward the green economy of the future, and the Global Warming Solutions Act, which will make Massachusetts a national leader in climate protection. Gov. 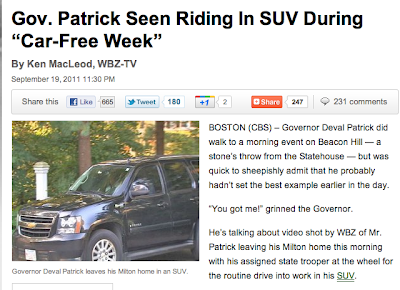 Deval Patrick, May 4, 2011, proclaims Sept. 18-24, "Car Free Week" and urges people to walk to work. The title of this posting is shamelessly stolen from Glenn Reynolds at Instapundit. Amazing video from the International Space Station of flying over the earth at night taken with a low-light HD sensor (select HD at the bottom of the YouTube frame). My favorite part is the thunderstorms which begin about 20 seconds in. The video ends when daylight begins. The research culture and motivational factors in the field of social psychology have arguably contributed to rewarding behaviors that are not in the best interests of scientific progress, in the same way that I have argued that the IPCC and the culture of funding, journal publication, and recognition by professional societies have not always acted in the best interests of scientific progress in climate field. I was particularly struck by the “data torturing” concept. Two posts down I talk about Greensburg's latest milestone. A young man in Joplin attained a milestone of his own today. Construction begins today on the new museum in Greensburg for their attraction, "the world's largest hand-dug well." Only the new museum will feature information about the tornado that destroyed the original. Details from the Dodge City Daily Globe. LAST weekend’s vigilance against potential terrorist attacks was an impressive demonstration of America’s resolve to prevent events of September 11th 2001 from ever happening again. From your correspondent’s hillside perch above Santa Monica Bay, he watched National Guard F-16 jets make repeated sweeps across the ocean by Los Angeles International Airport and then on to the huge port complex of Long Beach and San Pedro, while a Navy P-3 Orion maritime-surveillance aircraft circled overhead. The cacophony was deafening but reassuring. Angelinos slept easier that night. Yet, further down the coast, 6m citizens of southern California and south-west Arizona, along with their cousins across the Mexican border, were just recovering from a man-made disaster that had plunged their sweltering world into darkness—shutting down schools, hospitals, offices, factories, shops and restaurants, as lighting, air-conditioning and other essential equipment ceased to function. Beaches in San Diego had to be closed to the public because raw sewage had seeped into the sea. Passengers on trains stuck between stations and trapped in lifts had to be rescued by the police. Flights from San Diego International Airport were cancelled because of the lack of runway lighting. With traffic lights out of action and petrol stations unable to pump, motorists abandoned their vehicles and added to the gridlock that ruled the roads. By great good fortune, no-one died or was seriously injured. But normal life, for those so affected, ground to a miserable and unnerving halt. The power outage that swept across a large swathe of the American south-west on September 8th was the region’s worst cascading blackout in 15 years. It started at the North Gila substation near Yuma, Arizona, where a utility employee “was doing some work” on faulty equipment. Something happened (still under investigation) to cause the substation to shut down, disconnecting a 500kV transmission line connected to it and disrupting the electricity supply to Yuma’s 90,000 residents. The immediate power shortage at Yuma caused the current—which normally flows along the grid’s key Southwest Power Link from Arizona to California—suddenly to reverse its direction. The result was a violent fluctuation in line voltage that fed back through the grid to trip switches at substations throughout the San Diego area. Altogether, some 15 power stations in the region shut down automatically to protect themselves from voltage swings—the biggest being the 2,200MW San Onofre nuclear power plant up the coast near San Clemente. With the San Onofre plant disconnected and the umbilical cord from Arizona effectively severed, the delicately balanced grid serving San Diego and its adjacent counties quickly became unstable. Such problems would normally be resolved by ratcheting up the output of surrounding power stations. But with so little base-load capacity in the area, standby plants for meeting peak demand could not be spun up fast enough to stabilise the voltage. The overloaded grid promptly crashed, causing blackouts to spread across the region and into Mexico. The lights did not come back on until the following morning. The wind was blowing at only 8mph and the sky was partially overcast. So, California’s lauded sources of renewable energy were of little help. If anything, they were part of the problem. Critics point out, with some justification, that California’s energy strategy of focusing on conservation and expanding intermittent sources of renewable energy—while ignoring the urgent need for more base-load generating capacity close to big cities—was the primary cause of the grid failure. Less money for TSA's security theatre and more money to "harden" the electric grid would be a giant step in the right direction. Next, lets stop the "magic thinking" regarding renewable energy and build the modern (and less polluting than earlier versions) generating plants we need. "Nobody Has Ever Seen Anything Like It"
Damage in the Smoky Mountains from the April 27 tornadoes. Video and photos at the link. Thank you Kevin L. Nenstiel for the kind words and the review of Mike's book WARNINGS: The True Story of How Science Tamed the Weather. Kevin teaches English at the University of Nebraska and wrote on his blog that "Mike Smith Saves the World from Weather". Mike doesn't wear a cape to work, but he could. His passion is to save lives by providing early warnings for severe weather and he is a champion trying to save the tornado sirens use for only an acutal tornado and not to be used as a severe thunderstorm warning as some communities continue to do. Mike feels that the general public has become jaded to the threat of a tornado and the first inclination for some people is to go outside and look up into the sky to evaluate the threat for themselves. Mike feels that even one life lost in a tornado is too many and he wants people to be prepared so that a tornado is turned from a disaster into an inconvienence. The Wall Street Journal had a special section last week on smart ways to build a greener environment in general with cities a particular focus. The article I was most impressed with was some specific suggestions here. One of those suggestions pertains to walking and biking. I got to see a brilliantly executed example of this in Dallas ten days ago with their Katy Trail. They took the abandoned right-of-way from the old Missouri-Kansas-Texas Railroad (a/k/a "Katy") paved with with two lanes (one walking, one biking). Here are some photos I took of this surprisingly busy trail. My son, Richard with Maggie, on the walking part of the Katy Trail. The bikers are on the biking part of the Trail. The trail has pet-friendly disposal stations, 911 markers, etc., everything that would be needed for people to feel safe and healthy. The trail actually goes places: Richard now walks to the American Airlines Arena (on the trail). Businesses are also springing up such as the really cool Katy Trail Ice House. This is how you make environmentalism work! Make it painless, integrate it into the community, make it safe and convenient and people will respond. Many cities have abandoned rail rights-of-way. I salute Dallas for the outstanding work they have done with this resource. Is the Texas Drought Caused by 'Global Warming'? How Good Are Tornado Warnings Becoming? Can the World Continue Feed Itself?